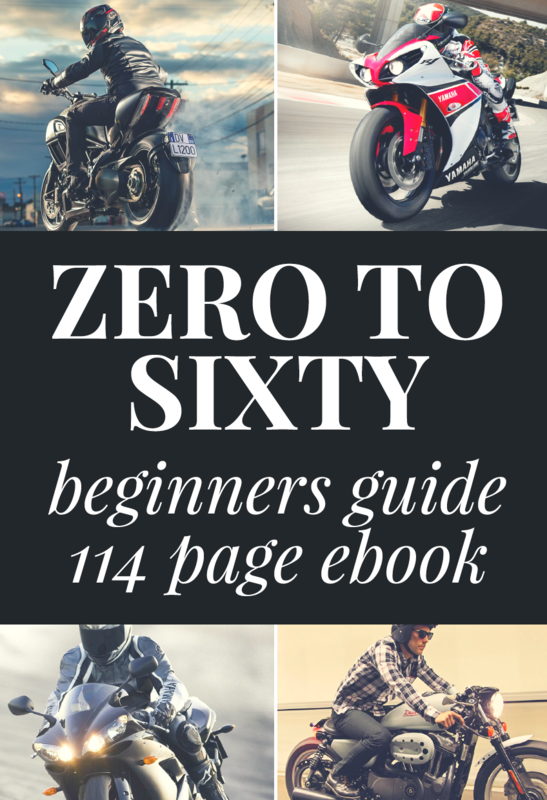 Motorcyclists often have to communicate with other people on the road much more often than people who drive cars. 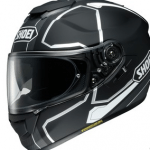 Whether it is warning other riders of potential hazards coming up or telling a car that is getting too close to you to back off. 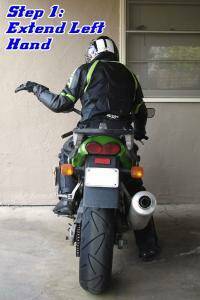 These are the basic hand signals every rider should know. 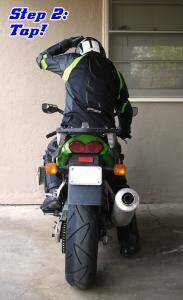 This is one of the hand signals that the law requires you to know. If you do not have blinkers you can signal you are making a left turn by extending your left arm straight out at a 90 degree angle to your body. Even car drivers that don’t know these signals can figure this one out pretty easily. Signaling this way makes you much more noticeable and I have started doing this as well as turning on my blinker when I am merging into the freeway. Anything that can make cages more aware of my presence on the freeway is a good thing in my book. (Note: Turning right is actually indicated with an open palm, not the closed fist like I have it pictured. Thanks Megaspaz!) Like the left turn this is another hand signal that you should know if you have your license. Unlike the left hand turn this one is a little more tricky to figure out if you aren’t familiar with it so don’t expect your average car driver to know what this means. 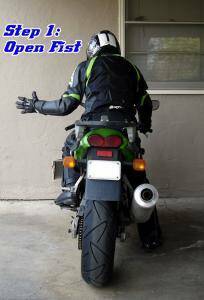 To signal a right turn extend your left arm out and bend it at the elbow so your hand is pointing upwards. The reason this is done is because motorcyclists control their speed with the throttle in their right hand, so they can’t very well extend their right arm to signal or else they would slow down. 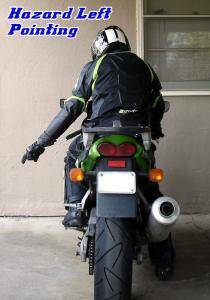 If you are leading a ride or there are any other motorcyclists following you it is helpful if you point out hazards in the roadway as you pass them. This could be roadkill, large potholes, pools of oil, or a spot of gravel in a turn. If it is on the left an easy way to do this is by pointing at the object with your left hand at a 45 degree angle. An even more universal and safer way to do this is by pointing at the offending object with your left foot. 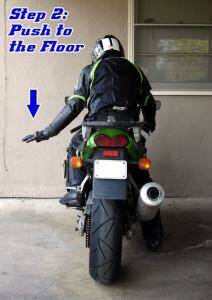 I prefer using my foot that way I can keep both hands on the handlebars and there is no confusing what I am trying to say. Like the left hazard if you spot something dangerous on the right just point at it with your right foot. You can’t signal with your right hand though which is another reason why you should just get used to pointing at things with your feet instead of your hands. 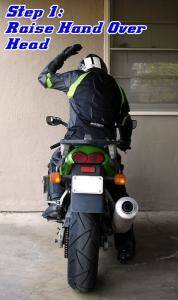 Although not an official hand signal by any means, I’ve recently been wanting a way to signal riders that one of their turn indicators is on. 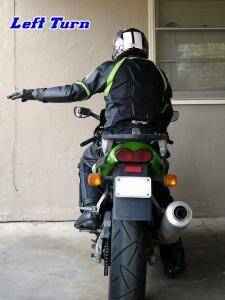 Motorcycles do not automatically turn off their blinkers after you successfully negotiate a turn so sometimes new riders forget they are on and will be riding for miles signaling that they are turning left! 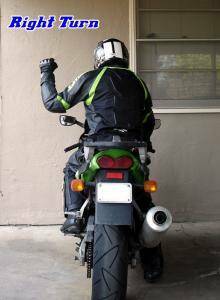 I’ve found the best way to signal that a riders blinker is on is to get in their field of vision and raise your left arm out while opening and closing your fist rapidly. You can combine this with turning on your turn signal briefly and then shutting it off after making the hand sign. I’ve only done this once personally and the other person seemed to get it. 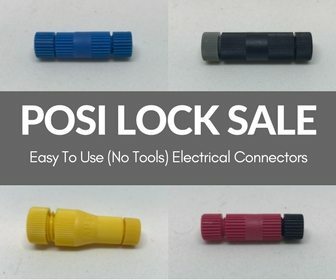 Feel free to let me know in the comments if you have any other ideas for a signal that might be more clear than this. If you see a corner up ahead that isn’t marked but you know its a hairpin that everyone is going too fast for, it’s good to signal everyone to slow down before you reach it. Do this by extending your left hand to the side and motion downward like you are patting a dog on the head. This is a fairly self explanatory hand sign and even someone that hasn’t seen it before should understand what it means. It’s also good if you feel like another rider (or driver!) is following you too closely. Probably one of the most important signals for me is the ‘Police Ahead!” motion. Unlike a lot of the other signs it might be a little confusing if you haven’t seen it before. 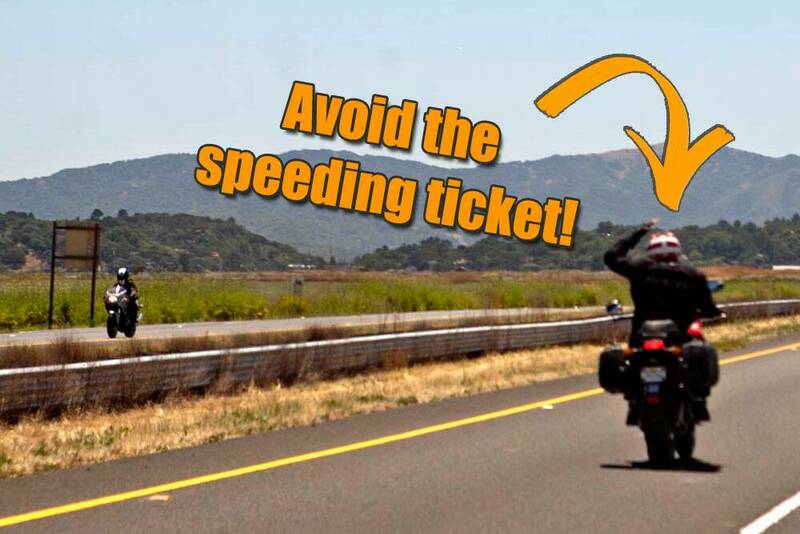 If you pass a speed trap and you see another rider heading towards it warn them by taking your left hand and tapping the top of your helmet a couple times. 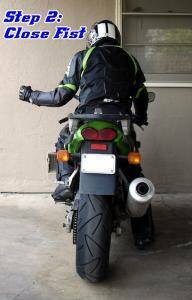 I have personally been saved on 3 separate occasions because a fellow rider has been nice enough to warn me of cops ahead. Once was on a trip from San Jose, CA to Carson City, NV and on the last leg of my trip I was on a fairly deserted road at 5am in the morning. I hadn’t seen another car in a while but I just happened to pass a biker who gave me the ol’ helmet tap routine. I waved and slowed down my pace that might have been a little faster than the posted speed limit.. *cough cough*. 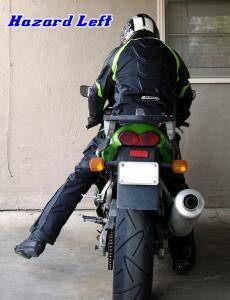 Sometimes when you are riding you will notice another driver making erratic or dangerous movements. Maybe they will be following you so closely they are clipping your license plate, or perhaps they merged into you almost forcing you off the road. In situations like this I tend to extend my left hand, bend it at the elbow, and raise my middle finger as an indicator of my displeasure. 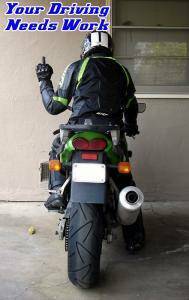 Use caution when performing this hand signal because it often makes the recipient of it very angry. If you are cruising near the beach with some great waves you will do other riders a big favor by letting them know of the current oceanic conditions. 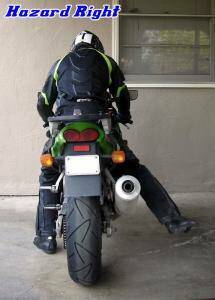 The only safe way to do this is by launching yourself unto your seat and riding your motorcycle like you would a surfboard. 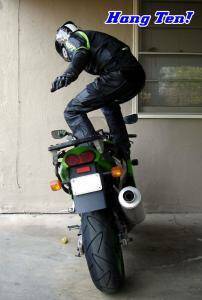 Please note that while a motorcycle can be ridden this way, they will sink if used as an actual surfboard.